Description: The 60s!!!! When I think of the 1960s, Woodstock, Hippies, and bold colored simply-designed jewelry come to mind. I was trying to create a project based on the above but the muse was just not speaking to me. 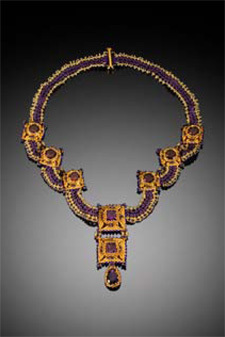 I began to research costume jewelry and design from the early to mid-60s and learned quite a bit! Rhinestones and Swarovski were everywhere along with this wonderful metal mesh. There were many designers who created wonderful designs for the general population and the runway. Check out Hobe, Di Lillo, and Coppola e Toppo to name a few. These designers were my inspiration for this necklace. Different components are made to emulate the gold “pillow” beads I saw in many pieces, stones or crystals are bezeled with two different techniques and joined with pieces of “mesh” made with seed beads. The necklace is named for one of my favorite actresses of the era – Audrey Hepburn and the best jewelry collector of all time – Elizabeth Taylor.